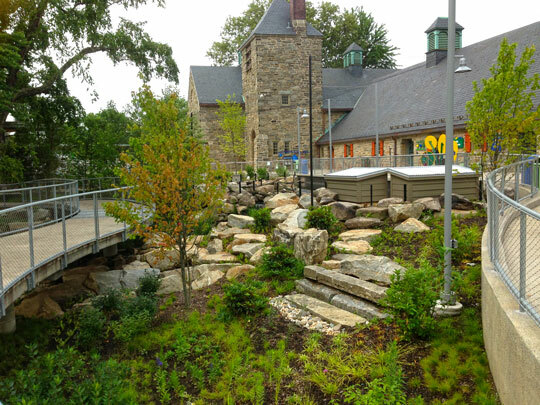 Meliora Design’s multidisciplinary team of engineers works with clients ranging from the Philadelphia Zoo to the City of Chattanooga, Tennessee, harnessing a range of technologies like rain gardens and porous asphalt to manage stormwater. “You don’t get to sustainable design with one discipline — it’s an integrated process,” says Meliora founder Michele Adams. “We’re engineers and scientists focusing on water issues, but it’s never just about the water. It’s about the community, the clients and making cities more resilient.” The Phoenixville-based Meliora (“always better” in Latin) was part of a winning team in the recent Infill Philadelphia: Soak It Up! design competition for the “Leveraging Plants + Water on Zero Lots Sites” presentation, which displayed their mastery of the intersections of landscape, design, urban renewal and stormwater management. Tags #56, December 2013, Greenprint, SoakItUp!